Traders unsure about the global economy have one place to turn – wheat futures. Looking back, the year 2007 happened to be extremely successful for the global food market. In particular, soybean prices increased more than 60 percent, the price of cacao increased by 18 percent and the price of coffee went up by 20 percent. And in the European market, wheat prices rose by 68 percent. Even at that time, participants in the market for food futures anticipated problems with wheat production, and their fears proved correct. According to outlooks from the U.S. Department of Agriculture, world wheat supplies hit a 30 year low in May 2008 – mainly due to a drought that affected wheat production in Australia and unfavorable weather conditions in Europe. Meanwhile, the demand for wheat from developing countries, primarily China and India, continued to grow. The market situation began to resemble the early 1970s. Beginning in 1970, stagflation – a combination of low economic growth and an increase in prices – took hold in the U.S and other western countries. In 1973, the economic growth rates in industrialized countries increased slightly, but still could not keep pace with inflation. In the United States and Western Europe, it reached almost 10 percent, and consumer prices in the U.S. rose by 7 percent during the year. The world faced an apparent food crisis: from the end of 1971 till the middle of 1973, the world wheat price increased by 75 percent, the corn price doubled and the soybean price tripled. This was accompanied by a currency crisis, in which the exchange rate for the U.S. dollar steadily fell around the world. This, in turn, increased the world demand for American foods, and U.S. authorities had to impose restrictions on the export of soybeans and other foodstuffs in order to prevent the internal market deficit. U.S. President Richard Nixon even froze food prices for 60 days to fight the growth of the internal agricultural food prices. By the end of the year, food prices in the United States rose by 15 percent. Russian authorities also used administrative measures in 2007 after noticing that food prices had been growing not only globally, but also in the Russian domestic market. In October 2007, then-Economic Development and Trade Minister Elvira Nabiullina announced: "To curb price rises, the government is planning measures related to foreign trade regulation and the fight against local monopolies in the regional markets as the price rises vary in different regions. Also, incentives will be provided to stimulate Russian agricultural producers. A draft resolution on raising the duties on wheat and barley has been introduced and the issue of the duties on milk and milk products is under discussion. We consider that these measures will bring a certain effect and enable us to curb the price rise in the domestic market." On Nov. 12, 2007 a 10 percent export duty on wheat and wheat/rye mix and a 30 percent export duty on barley came into force. 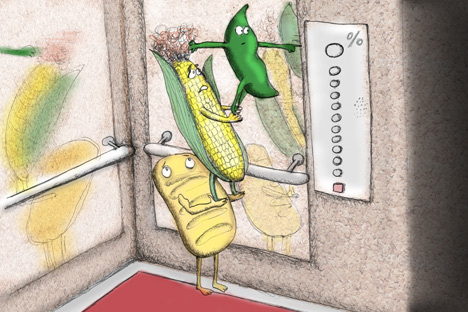 Today, the world is once again observing an extremely rapid growth of food prices: since mid-June, world wheat prices have increased by over 50 percent and corn prices have risen by over 45 percent. Soybean prices have grown by 30 percent during the past two months and by almost 60 percent since the beginning of the year. Players on the world food market buying wheat, corn and soybean futures have once again pointed out the objective facts behind the rise: the grain harvest in the U.S. will be down due to drought; drought has also affected the harvest in Russia, Kazakhstan and Ukraine. The grain harvest in Europe, in contrast, was reduced due to unusually wet weather, and in India, it is down due to the late start of the monsoon season. The Russian domestic market has also experienced a dramatic increase in prices. The price for the third-class wheat increased from 7,500 rubles per ton as of July 13, 2012 to 8,060 rubles per ton as of Aug. 3, 2012. The price for fourth-class wheat rose from 7,280 rubles per ton to 7,820 rubles per ton during the same period. Corn prices grew from 7,280 rubles per ton to 7,500 rubles per ton, feed wheat prices rose from 6,800 rubles per ton to 7,340 rubles per ton and barley prices increased from 6,380 rubles per ton to 7,040 rubles per ton. Now, traders face the following situation. Investments in U.S. and European securities look unattractive due to the European debt crisis and the slowdown in economic growth cessation in the industrialized world. Taking into account the economic growth problems, investments in oil futures also seem highly doubtful, as no growth of oil demand is predicted and these futures tend not to grow but drop in price. In the current financial situations wheat, corn and soybeans are, eventually, likely to be the last chance for a trader facing the second wave of the global crisis. This text is available in the original Russian in the Kommersant-Vlast magazine.